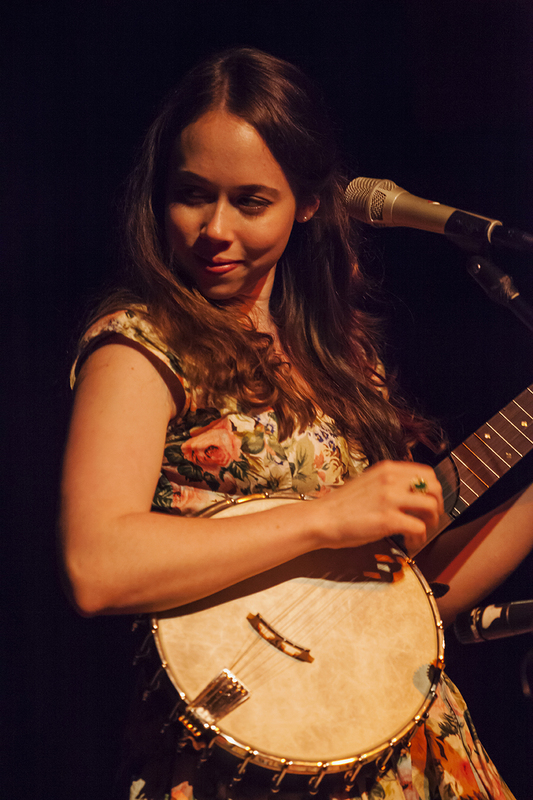 Sarah Jarosz at wintergrass 2015. photo by hermon joyner. By her own accounts, Sarah Jarosz has been singing since she was two years old, picking the mandolin when she was ten, and things have been rocketing skyward from there. She recorded her first album, Song Up In Her Head, six years after her first introduction to the mandolin and one instrumental track from it, “Mansinneedof,” was nominated for a Grammy. Her next CD, Follow Me Down, was released in 2011 when she turned 20. This was followed up with her recording, Live at the Troubadour in 2012, which featured her touring back-up collaborators, Alex Hargreaves on fiddle and Nathaniel Smith on cello. Her latest album, Build Me Up From Bones, was released 2013 and it was nominated for Grammy Awards for Best Folk Album and Best American Roots Song for the title track. In a relatively short amount of time, Jaraosz has garnered an enormous amount of accomplishments and taken her career to places many musicians can only dream of, but watching Jarosz play and sing, and listening to her talk about her music, it’s obvious that she has yet to reach the limits of her potential. Her career is still gaining momentum with little sign of letting up. Sarah Jarosz at Mississippi Studios, Portland, Oregon, 2011. photo by Hermon joyner. Nathaniel smith, sarah jarosz, and alex hargreaves, 2011. photo by hermon joyner. Her banjo is more unusual and more than a bit special. Jarosz explains, “My banjo is a six-string clawhammer banjo, which is kind of rare. It has an additional low string. It’s built by Bernard Mollberg from Blanco, Texas, who has only built a few banjos, but he’s an excellent luthier and he was my first clawhammer banjo mentor.” Jarosz met him at the weekly bluegrass jams in Wimberley and Mollberg is one of the founders of the Austin Friends of Traditional Music. sarah jarosz at the mississippi studios, portland, oregon, 2011. photo by hermon joyner. Most of the changes in her voice came from Jarosz’ decision to study music in college. She decided to temporarily put off a life on the road as a full-time professional musician while going to college. It was a choice that was not without its share of controversies. Jarosz said, “Gary and I talked about the pros and cons of going to college or just touring on the road. I know him and some other important people in my life thought, ‘School is awesome, but we don’t want you to lose the soul of it.’” But Jarosz felt it was important to be pushed out of her comfort zones and to try new things. So Jarosz enrolled in the New England Conservatory (NEC) of Music in Boston. At first, a classical music institution seems like a strange fit for a mandolin- and banjo-playing girl raised on bluegrass, but you have to remember the house that she grew up in valued all music, from jazz to classical, and from folk to rock. And it didn’t hurt that Jarosz’ friend, Aoife O’Donovan, lead singer for the band, Crooked Still, was a graduate of that school and recommended it strongly. O’Donovan said that Jarosz should get into the Contemporary Improvisation Program, a program that stresses the importance of personal style, the role of creative improvisation, and the need to push the boundaries of music. Jarosz took O’Donovan’s advice and found that she loved college. Jarosz said, “On any given day, I had liberal arts courses, musical history classes, private lessons, and ensembles. I was in a songwriting workshop, a world music ensemble, and a Jewish music ensemble, and on top of that there was the classical tonal harmony and theory classes, which required you to have a keyboard class. So it covered a lot of the musical spectrum. It was totally awesome.” And she even was able to play her banjo in the music ensembles, which was a definite plus for Jarosz. She graduated from NEC is 2013, moved to New York City, and began her musical career in earnest. Part of the guiding philosophy of NEC comes from the classical composer and conductor, Gunther Schuller, and his idea of the Third Stream, which mixed elements of jazz and classical music while stressing improvisation. This was popular in the mid-20th Century and was represented by composers like George Gershwin, Igor Stravinsky, and Duke Ellington. Today, Americana Music is a similar movement and is represented by groups like The Decemberists and Trampled by Turtles. Americana music, or Roots music, draws diverse influences from other musical genres like Celtic, folk, blues, R & B, pop, rock, jazz, bluegrass, and country. All these various musical ideas are mixed together and come out in an original way. Sarah Jarosz and her music fits rather neatly into this movement. Feeling at home and comfortable with her music, her performances, and her audiences does a great deal to explain her continuing popularity. In February of this year, in Bellevue, Washington State, she walked out on the stage at the Wintergrass Music Festival flanked by her instruments—octave mandolin, guitar, and banjo—and acted like she was in her own home; open, relaxed, and gracious. The crowd, which filled the large auditorium, was as wide-ranging in age as the sources of Jarosz’ music, was ecstatic and cheered nearly every song she played when she announced them. Her playing was flawless and her voice sprang straight from her heart. In 2015, Sarah Jarosz will turn 24 years old, will work on her next album, and will tour with her friends Aoife O’Donovan, formerly from the band Crooked Still, and Sara Watkins, from Nickel Creek, of course. They will tour throughout Europe and the UK as the “I’m With Her” Tour, and will continue that tour in the US this coming summer. Together, these three are an obvious force to be reckoned with and can be seen as possibly the future of roots music in the US.